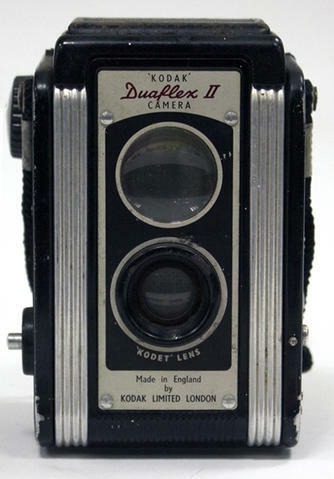 Item is a mock twin lens reflex camera with Bakelite body and metal fittings, for use with 620 roll film. Designed to mimic the look of a twin lens camera, the topmost "lens" is in fact a brilliant viewfinder; it is a simple box camera design. The f8 lens has a 3 aperture settings.